I’m not usually a peach girl but there has been something about peaches this year that just makes me want to cook with them. My family loves banana bread and we have to limit ourselves on how many times we make it because we will gobble it right up! I think that might be the same way with this bread! I’m a sucker for cobbler! This is so good that you could serve it as a dessert at any party with a big scoop of ice cream or a dollop of whip cream and your guests will go crazy! It also is amazing as a after school snack for your munchkins after school, either way, you will love it. Preheat oven 350 degrees. Grease and flour a 9 x 5 loaf pan. In a large bowl, cream together the butter and sugar. Add the eggs, one at a time, beating well after each egg. Add the water and vanilla. With a spatula, stir in the peaches. In a separate bowl, combine flour, baking soda, salt, and the baking powder. Gradually add the dry mixture to the creamed mixture. Stir in the almonds. Pour batter into the prepared loaf pan. Combine the topping ingredients and sprinkle them over the bread. Bake on 350 degrees for 50 to 55 minutes or until a toothpick inserted in the middle comes out clean. Cool for 10 minutes before removing from the pan. WOW! This is right up my alley! Pinning! Making this today! I have ripe peaches all ready to use. Thanks for the timely recipe! This looks yummy. We just got some local peaches at the Farmers Market on Saturday and they may end up in this recipe. 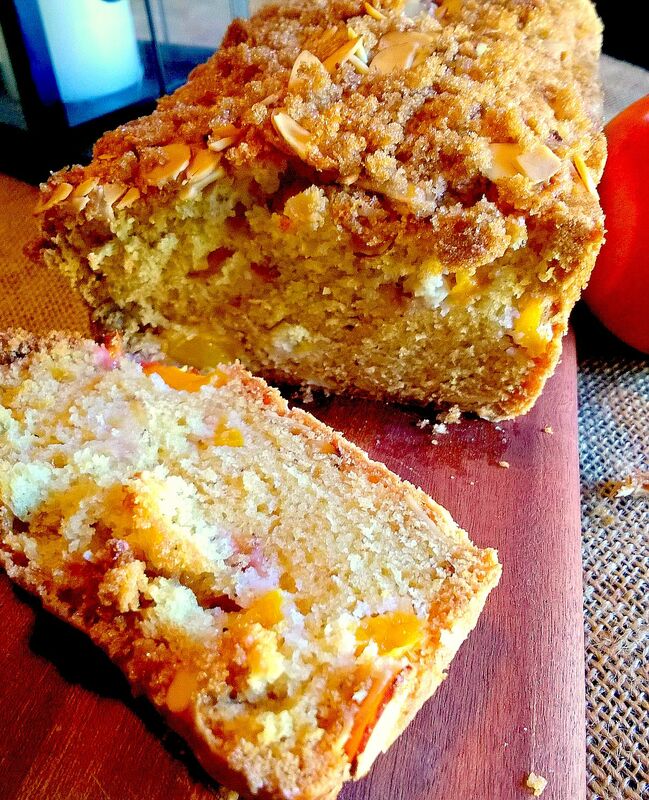 We love all kinds of bread but fruit bread is the best – tasty and moist. Thanks for sharing this recipe as it looks like a keeper !! This looks amazing, I wonder if you could use canned peaches, or do you think they would be to soft and no withstand the baking? However, with that being said, I will be pinning to save for future use, a nice change from banana bread. Thanks for sharing on Oh My Heartsie Girls WW this week, I appreciate your sweet visit!!! Ya'all have a great week!! Oh my gosh, this sounds divine! I love banana, zucchini, or any other type of bread, but this one is a whole new concept to me. I am pinning right now, so I can get the ingredients and try it. Thank you so much for sharing at Merry Monday! Well, thanks to your gorgeous photo I have been forced to pin this recipe and will have to give up my precious time at the weekend to try it out! Seriously though, it looks amazing. 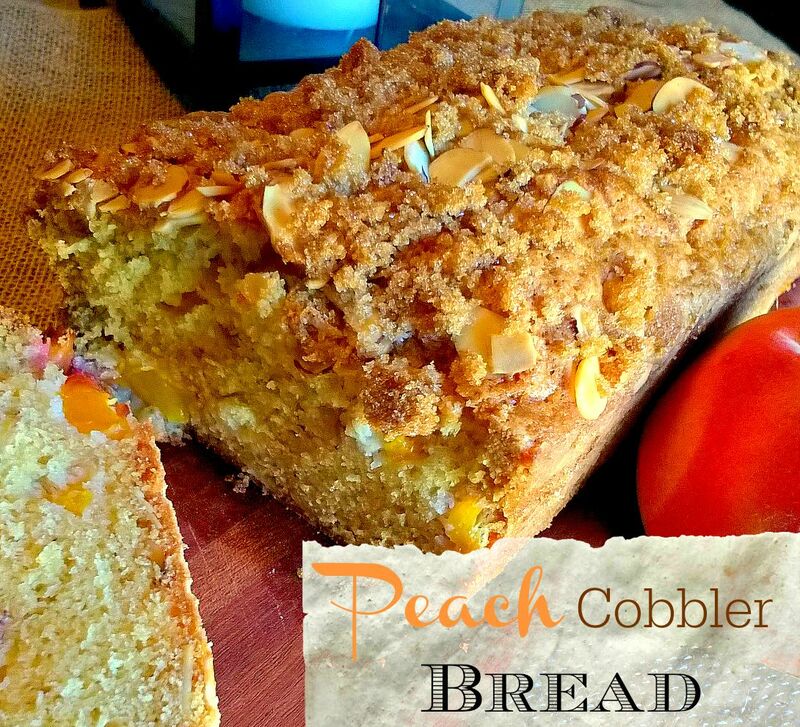 Never tried peach cobbler, but looks really good! OMG this is just to good to be true. I have to make this for my husband. He loves peach cobbler. I wish I had some peaches, I would make it now. Yum! This looks like a wonderful bread for snacking on. Thank you for sharing your post at the #AnythingGoes Link Party. This bread looks delicious! Thanks for linking up with What's Cookin' Wednesday! What an awesome idea. So glad you shared with us at Weekend Potluck. Pinning! I'm not one to pick up a peach and eat it, but throw some sugar in with that peach-dessert style-and I'm all about it! Yum! This looks so good, and not too difficult, love that! Thanks for sharing at #WAYWOW I am pinning to make later! Thanks. Oh Yum!! I want some for my Sunday Brunch!! Thanks for Sharing on My 2 Favorite Things on Thursday!! Pinned! Hope you come back tomorrow! !